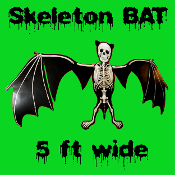 Black and White colorful cardboard paper sectioned fold-out Halloween decoration, unfolds to 5-feet wide!!! Graveyard, Cemetery, Dungeon, Torture Chamber, Horror, Walking Dead Decor Theme -- Looks super creepy mounted above an entry door or window!! !